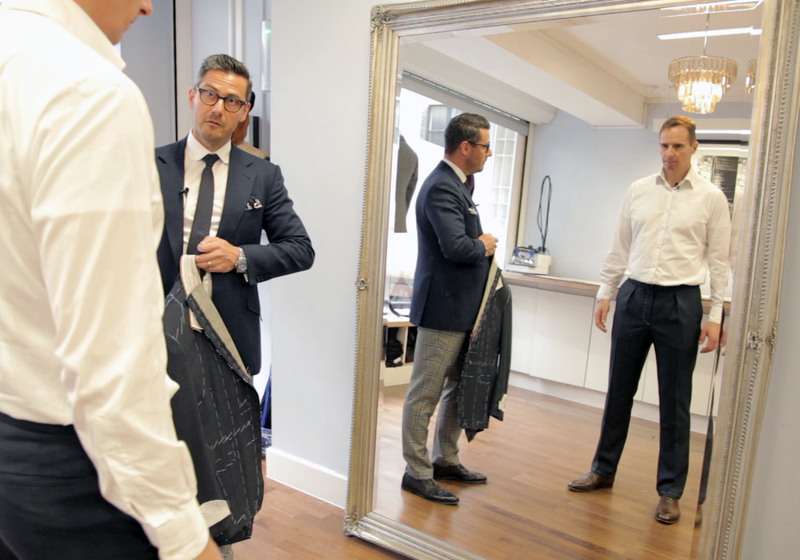 If the single-best reason for a man to order a bespoke jacket is choice then the primary reason to have a pair of bespoke trousers tailored is fit. While, with some diligent research, a man can find ready-to-wear trousers in most fabrics he has to take what he’s given when it comes to the shape and style. This is a shame because a pair of bespoke trousers shouldn’t just be supremely comfortable, they should also do wonders for a man’s perceived height and weight. Fashion currently dictates that men wear tight, low-cut trousers. This flatters very young men with pipe-cleaner legs, but any one with a more athletic build is better served with looser fitting trousers. To get into the nitty-gritty, if a man’s spent time in a gym squatting and lunging then he should ask himself if cramming his glutes and thighs into skin-tight trousers is a good idea? Far better to have a tailor create a personal pattern that will, in an ideal world, be slim at the waist, give you room over the backside, and can then be gradually tapered towards the knee. The beauty of bespoke is that the style of trousers is a personal choice, but the flat-fronted, frog pocket form Chris usually cuts is timeless (and as tailoring’s an investment it’s worth thinking long-term). The fact that they sit up towards the waist lengthens the appearance of the legs, and there’s a lovely taper towards the point at which they kiss the top of the shoes. If you want to keep the mood informal add chunky turn-ups to hit a sporty note. With an eye to autumn, relevant fabric choices currently include corduroy, whipcord, moleskin and flannel – go for the heaviest weight you can lay your hands on. The results should prove incredibly versatile, and as suitable in the office (worn with a jacket) as they are at the weekend (worn with a sweater).